Education Secretary Betsy DeVos last year praised President Trump's decision to pull the United States from the Paris climate accord. Her staff later told her what she had said about it. DeVos' chief of staff approved the secretary's two-sentence statement on Trump's exit from the climate change agreement, with her espousing the president's rollback of "overreaching regulatory actions" and keeping his promise "to put America and American workers first." Aides later worked to bring it to DeVos' attention, according to emails obtained by E&E News under the Freedom of Information Act. The emails offer a behind-the-scenes look at how the White House ordered agency leaders to publicly praise Trump's announcement on Paris, which was a year ago today. Cabinet secretaries and their communications shops jumped into action, with messages ranging from DeVos' vague praise of putting "America first" to Commerce Secretary Wilbur Ross decrying the "economic carnage" of the climate treaty. Liz Hill, the Education Department's press secretary, said that day in an email to another aide, "We didn't send out a press release or anything, but we did [sic] out a statement on the website that she should be made aware of. It was approved by josh before it went up." The Josh she referred to is Josh Venable, DeVos' chief of staff at the department. Earlier that day, when Trump was announcing his decision on the climate deal, Hill sought his approval of DeVos' statement. "Are you ok with this title and intro sentence?" Hill asked in one email. Venable responded, "yes." Hill also later checked in with another aide to see whether DeVos had seen her own statement. "Were you able to send this over to BDV?" the press official asked. "Sent over. Haven't heard back," said the aide. The day after Trump's announcement on the Paris Agreement, reporters pressed DeVos on her statement during an event at a Washington, D.C., charter school. The Education secretary repeated her praise of the president but didn't share much more, including her views on climate change. 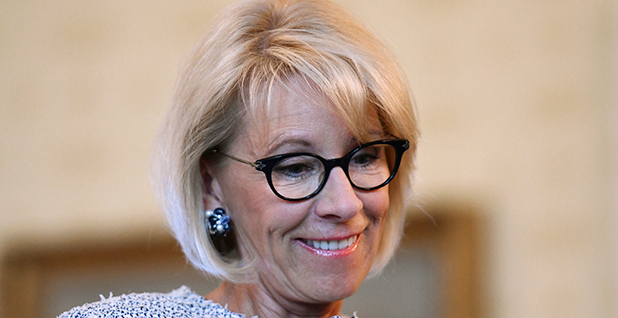 "I'm here to talk about students and schools today, and I would hope that we could focus on the opportunity that these kids have in this unique environment and this unique school with amazing teachers and administrators," DeVos said, according to The Washington Post. Her Paris statement attracted criticism from Democratic senators. They sent a letter the following week to DeVos, saying her statement was "a quick about-face" considering that during her confirmation hearing, she said she would defer to other agencies on the issue of climate change. Education Department press officials, including Hill, didn't respond to questions from E&E News for this story. DeVos was one of several Trump Cabinet officials to issue statements on the president's Paris decision. At least nine officials, including many not heavily involved in the move to withdraw from the agreement, released statements that day (Greenwire, June 2). The public relations push came after a request from the White House, according to other records obtained by E&E News under FOIA. "Cabinet Communicators!" Kaelan Dorr, then an aide in the White House press office, said in an email a little over two hours before Trump announced his decision. "Please join our surrogate briefing call at the below number at 1:30pm. We need all Cabinet agencies to prep statements of support for the decision being announced at 3:00pm in the Rose Garden," he said, asking those statements be sent to him and other White House press aides for approval within 30 minutes of the call's conclusion. "No exceptions," Dorr said, adding that talking points would also be distributed after the call. Asked why the White House wanted agencies across the federal government to comment on the climate accord, a spokeswoman said the decision to leave the deal was the result of "an interagency policy process." "The Trump Administration, after conducting an interagency policy process, concluded that withdrawing from the Paris Climate Accord was the best decision for the United States and for the American people. One year later, there has been no change in the U.S. position," said Lindsay Walters, the White House deputy press secretary. Other agencies, too, quickly got to work after the White House request. The Commerce Department put together a statement from Ross saying the Paris deal's "economic carnage" was "unjustified." "Let it fly at end of presser," James Rockas, a Commerce press aide, said in an email. Other agency staffers had some questions. "Ill start drafting a statement. ... Does he have an opinion on it?" Jillian Rogers at the Labor Department said in an email. Labor Secretary Alexander Acosta said in a statement that withdrawing from the climate deal would grow jobs and stimulate the economy. After Trump announced his decision, the White House also urged Cabinet members to do television and radio interviews on the Paris accord. That request was greeted with a question at the Office of the U.S. Trade Representative. "What would his message be?" G. Payne Griffin, a deputy chief of staff at USTR, asked in an email. U.S. Trade Representative Robert Lighthizer, in his own statement on Trump leaving the Paris Agreement, had espoused jobs and said the accord represented "another unfair trade barrier." Click the following to read how the departments of Commerce, Education and Labor as well as the Office of the U.S. Trade Representative drafted their statements on the withdrawal from the Paris Agreement.